Dramatic and beautiful, the Helena Crystal Wedding Necklace will make a standout addition to your wedding day jewellery collection. 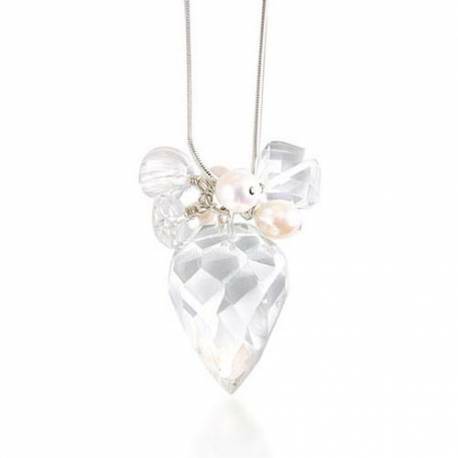 Handmade and unique, it features and outstanding pendant with a heavy faceted crystal teardrop accented with shimmering natural quartz beads and iridescent freshwater pearls. To maximise the natural radiance and inimitable sparkle of the pendant, it is displayed on a classic sterling silver chain, which is available in five lengths to allow endless styling options. A stunning wedding day gift for brides and bridesmaids, this crystal wedding necklace can be worn as a choker or on a 30” chain to complement all necklines. As the quartz is natural quartz there may be minor imperfections in the teardrop. Your crystal wedding necklace will be beautifully gift wrapped in a signature Bish Bosh Becca glossy white box, tied with white organza ribbon edged in satin and a gold foil gift card enclosed, making this an ideal gift. The message on the gift card says "there is no remedy for love but to love some more". Sterling silver with freshwater pearls and quartz. The sterling silver box chain is available in five lengths. 14"/35cm choker with 5 cm sxtension chain. 16"/40cm,18"/45cm, 20"/50cm, 22"/55cm, 24"/60cm 26"/65cm. 28"/70cm and 30"/75cm. The teardrops are rounded and are approx 20mm by 15mm (at its widest part).